A few months ago a paper by Jim Houston and Bob Dean in the Journal of Coastal Research (JCR) cast doubt on whether global sea level rise has accelerated over the past century or so. As things go these days, ‘climate sceptics’ websites immediately heralded this as a “bombshell”. A rebuttal by myself and Martin Vermeer has now been published in JCR. The keystone of the argument by Houston & Dean is the fact that a prominent global sea level reconstruction (Church & White 2006) shows no acceleration since 1930. Which raises the question: why 1930, given the sea level data set starts in 1870? The reason becomes immediately evident when looking at the acceleration starting from any arbitrary date (Fig. 1). Figure 1. 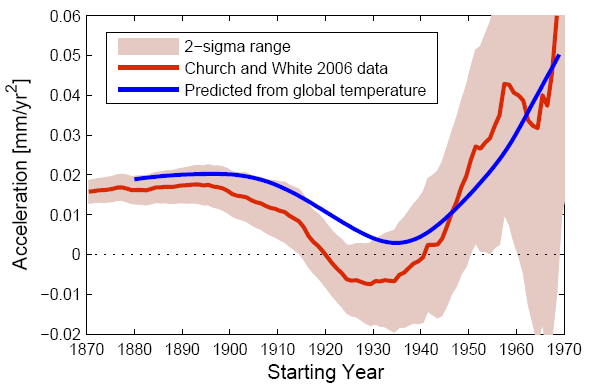 Acceleration of sea-level rise (i.e., twice the quadratic coefficient) from different starting years up to 2001 in the global tide gauge data set of Church and White (2006; red line with uncertainty band). Note that after ~1960 the calculation gets excessively ‘noisy’ because the time interval gets too short to robustly compute acceleration. I graphed this right away after reading the Houston & Dean paper, and a few days later Tamino independently came up with a similar plot – it’s the obvious thing to do. 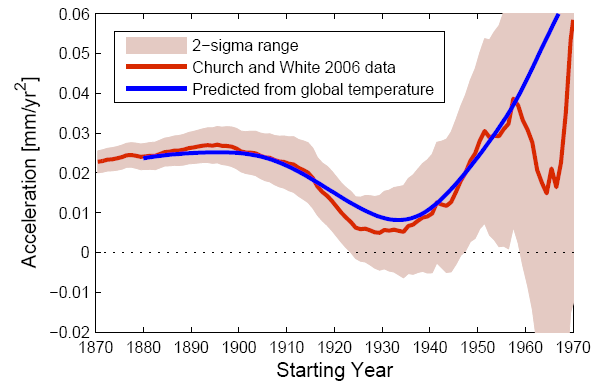 The blue line shows the same quantity from the sea-level hindcast of Vermeer & Rahmstorf (2009) computed from global temperature data. Around 1930 we see a unique minimum in the acceleration curve – I will explain the cause of this shortly. Other start dates either before or after this minimum show positive acceleration. Picking 1930 for this analysis is thus a classic cherry-pick, and according to the authors that is no accident. They write in the paper: ‘Since the worldwide data of Church and White (2006)…appear to have a linear rise since around 1930, we analyzed the period 1930 to 2010.’ The interval was thus hand-picked to show a linear rise rather than acceleration. Houston & Dean use their result to question the future acceleration of sea level rise predicted by Vermeer & Rahmstorf (2009) for the 21st Century as a consequence of global warming. They argue that the 1930s acceleration minimum calls into question the semi-empirical link between global temperature and global sea level proposed by us in that paper. However, it is clear they never bothered to check this, because quite the opposite is the case: our semi-empirical formula predicts this acceleration minimum, as the graph above shows. As it turns out, this is an expected outcome of the mid-20th-Century plateau in global temperature. If one subtracts out the non-climatic sea level change due to water stored in artificial reservoirs on land, as we did in Vermeer & Rahmstorf (2009), then the agreement between the acceleration curve predicted from global temperature with the actually observed curve is even better (graph below). Thus, the 1930s acceleration minimum pointed out by Houston & Dean supports our approach and projections rather than challenging them. Figure 2. The same as Figure 1, but here the sea-level data are corrected for water storage in artificial reservoirs (Chao, Wu, and Li, 2008). it is not clear that the acceleration necessary to achieve these comparatively large projected rises in mean sea level over the course of the 21st century is evident in tide-gauge records. That is a puzzling statement. Why would the acceleration we expect only for the 21st Century already show up in tide gauge records of the 20th? Since we expect a temperature rise to cause an acceleration of sea level rise, the acceleration in the 20th Century (which has seen only 0.7 ºC of global warming) must obviously be much smaller than that expected for the 21st Century, for scenarios of a many times greater warming. 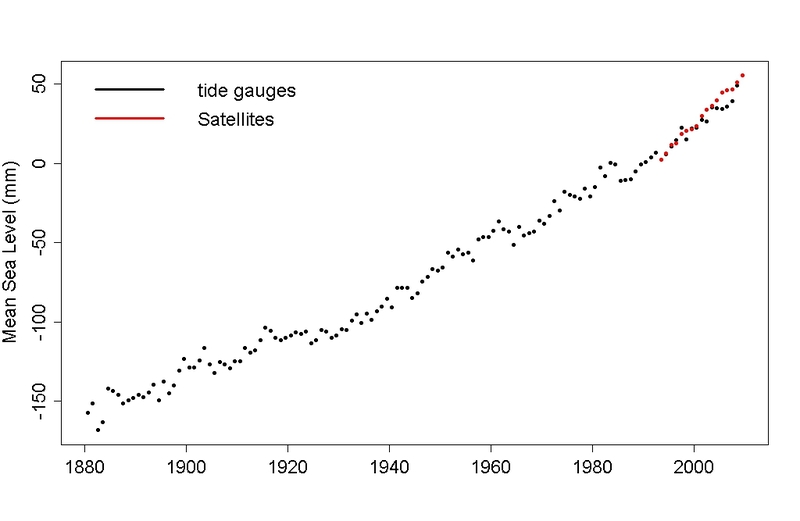 Many U.S. tide gauges show a deceleration; since 1930, most of them do. However, again, 1930 is a special choice, and U.S. tide gauges only provide a regional signal, not a global one. The authors’ extension of the Douglas (1992) sea-level compilation shows a sea-level deceleration for 1905–2010. But this data set is not a properly area-weighted global average but is instead highly biased to the Northern Hemisphere. It is known that the twentieth-century acceleration is largely found in the Southern Hemisphere (Merrifield, Merrifield, and Mitchum, 2009), and the only two Southern Hemisphere groups in the extended Douglas data set indeed show acceleration. Decadal trends in tide gauge compilations show large variations over the full record, and the most recent decadal trends are not unusual. However, these variations in decadal tide gauge trends are not a climate signal but rather are dominated by sampling noise due to the inadequate number of tide gauges. The satellite altimeter record shows a slight deceleration since 1993. But this time interval is far too short to draw any conclusions. None of this supports a lack of acceleration in global sea-level rise, as compared to what is expected from global warming. Outside a few starting years around 1930, global sea-level reconstructions robustly show a modern acceleration of sea-level rise in conjunction with global warming. For the evidence, just have a look at some of the references listed below. p.s. I just see that JCR also carries a reply by Houston & Dean to our comment. This largely focuses on our supposedly “selective” use of data, because we show the acceleration of sea level rise ‘only’ for starting years from 1870 (the start of the data set) to 1970 (after which the computation is too noisy to be meaningful by anyone’s standard). This is slightly ironic given that Houston & Dean focused only on the rather unique start year 1930. Houston and Dean further argue that the data already become too noisy around 1940 because “decadal fluctuations begin to dominate records shorter than about 60 years, and accelerations become increasingly meaningless for starting years in Figure 1 greater than about 1940”. We disagree: while this may be true for individual records it is not true for the global sea level reconstruction shown. The 2-sigma range and the fact that the curve is smooth until then shows it is meaningful up to about 1960; we continued the graph up to 1970 in order to show (rather than just claim in the text) how the uncertainty explodes after 1960. In any case, by showing the plot until 1970, we allow readers to see the full potentially meaningful range and judge for themselves whether they see any significant difference between the data and our model. That our model is somehow called into question by the observed sea level acceleration was, after all, a key claim in Houston & Dean’s original paper. Houston & Dean excuse the strong northern-hemisphere bias introduced by their simple averaging by saying that “this criticism would apply to any study of sea-level rise”. That is not true; the sea level data set we use (Church and White 2006) and also the temperatures (GISS) use an area-weighted averaging scheme that makes sure the northern and southern hemispheres are properly represented in proportion to their surface areas, regardless of the data density. But at least on one thing we agree. As Houston & Dean state in their final sentence, we indeed predict a much larger acceleration of sea level rise in the 21st Century than is observed in the 20th Century. That is a direct logical consequence of the fact that we expect much larger warming in the 21st than in the 20th. Update 24 July: A related case of “lack of acceleration” – also from the Journal of Coastal Research – is expertly treated by Tamino here: How Not to Analyze Tide Gauge Data. It does raise some questions about the quality of peer review at JCR. Church, J. A., N. J. White, 2006: A 20th century acceleration in global sea-level rise. Geophysical Research Letters, 33, L01602. Douglas, B. C., 1992: Global sea level acceleration. journal of Geophysical Research-Oceans, 97, 12699-12706. Houston, J., R. Dean, 2011: Sea-level acceleration based on US tide gauges and extensions of previous global-gauge analysis. Journal of Coastal Research. Merrifield, M. A., S. T. Merrifield, and G. T. Mitchum, 2009: An Anomalous Recent Acceleration of Global Sea Level Rise. Journal of Climate, 22, 5772-5781. Rahmstorf, S. and M. Vermeer, 2011: Discussion of: Houston, J.R. and Dean, R.G., 2011. Sea-Level Acceleration Based on U.S. Tide Gauges and Extensions of Previous Global-Gauge Analyses. Journal of Coastal Research 27, 784–787. Vermeer, M., S. Rahmstorf, 2009: Global Sea Level Linked to Global Temperature. Proceedings of the National Academy of Science of the USA, 106, 21527-21532. Why do both lines (red: data, and blue: predictions) both change between figures 1 and 2? If the same corrections is being applied to both series for the land storage effect then why would the agreement between the curves improve? Great article, Stefan. What is your current prediction for SLR in the 21st century? I find it sadly ironic that the big picture is often ignored to focus on a distraction. Example: If global warming causes a land based glacier to melt faster, which thereby adds more water to a lake, the lake level rise would then be used as a claim that global warming is not happening because there are supposed to be more droughts and in a warmer world the water would evaporate faster and the lake level would go down. Obtuse reasoning seems to remain the game. One of the reason why the UN Security Council to take up climate change. Is it fair to say that the semi-empirical model “predicts” the acceleration minimum, if it is calibrated to the full SLR record, which has an acceleration minimum in it? It’s not really an independent prediction. It’s reasonable to expect an acceleration minimum in SLR based on the time series behavior of the temperature record alone, but that expectation presumes a certain relationship between temperature and SLR. It’s dangerous to “peek” at the historic SLR data to hone that relationship, if you’re interested in historic SLR hindcasts. A possible alternative: for each start year Y, fit the semi-empirical model to temperatures and SLR before Y. Use that fit to predict the SLR acceleration (to present day) based on temperatures – but not SLR – since Y. Have Houston and/or Dean any known links to ‘doubt’ organisations? Just a general comment: Measuring sea levels, sea level rises, and rise accelerations has always struck me as tantamount to measuring the breadth of say the Atlantic Ocean with a micrometer. No matter how much care and sophistication is taken in the measuring process it seems grossly flaky. But its somewhat similarity with climate models makes it a tad interesting and not deserving to be discarded out of hand. Still I don’t think it tells us much. The global average sea level was accelerating at 0.016 mm/year^2 in 1900? Really?? My criticism applies equally to Houston & Dean and Church & White 2006, though I too would add their 1930 cherry picking as an added criticism. Sea level rise seems to be most concentrated in the southern hemisphere. Why? I am assuming thyat, though the volume of seawater is increasing due to post glacial era melting, so causing a rise in sea level around the globe, in the northern hemisphere,where ice sheets were extensive over Eurasia and N America, isostatic uplift is currently ofsetting yhe eustatic rise in sea level. Northern Britain, for example, is still rising in compensation for the loss of the ice sheets, as is Scandinavia. Southern Britain and Europe are apparently sinking, presumably due to lower rates of isostatic uplift and a contemporaneous rise in sea volume. Presumably, the Southern Hemisphere, being composed of mucch larger extents of ocean than land mass, were not affected in the same way by ice sheets, so isostatic uplift has been low or non existent. The rise in water volume in the oceans will therefore register as a rise in sea level. Am I correct in this? Can someone explain any other mechanism that results in sea levels rising more in the Southern Hemisphere? Yes, the same chapter that made the mistake about the glaciers on p. 493, but nevertheless a very useful compendeum of how we are harming Asia by our GHG emissions. Just a general comment: Measuring sea levels, sea level rises, and rise accelerations has always struck me as tantamount to measuring the breadth of say the Atlantic Ocean with a micrometer. No matter how much care and sophistication is taken in the measuring process it seems grossly flaky. Arguing from personal incredulity is boring, non-informative, and not in the least persuasive. Mike – Indian Ocean and Mitrovica. To Comment 9: There is an immediate gravitational feedback when ice mass is lost. The Greenland ice sheet attracts water, so when it loses mass, it attracts less water. There should also be an elastic rebound associated with present-day ice loss. You were describing the viscous rebound response, which is important but related to past deglaciation, not so much present-day melting. is close to a straight line but is concave up, which means accelerating. That is eyeballing with a straightedge. There is nothing that says that acceleration can’t increase. 2 artificial lakes were filling up, as behind Hoover Dam. I don’t understand why you call it a Mid-century plateau. 1930 is before mid century. Measuring sea levels, sea level rises, and rise accelerations has always struck me as tantamount to measuring the breadth of say the Atlantic Ocean with a micrometer. Yeah, and you know what else is happening to these goofy scientists and their goofy sea level measurements? The moon is moving farther away from the Earth every day! Talk about throwing a wrench into the gears. And how do they think that they know that? They ‘measured’ it. Crazy. I know Drs. Houston and Dean personally, Dr. Houstion was my first boss at the USACE ERDC CERC (now CHL). I have had some further interactions with Dr. Houston up through 2008 (working for Drs. Resio and Fowler on a military project called LMCS (Lightweight Modular Causeway System), think D-Day landing type infrastructures). I worked with Dr. Dean on an experimental study for the Port of Long Beach back in the mid 90’s. One of the CERB board members, Mr. Headland, who I also know personally (when he worked for the Navy and where he now works at Moffett & Nichol), using a FEA/FD numerical model of 1st/2nd order moored ship motion (think harbor resonance and floating bodies (e. g. large ships)) for the Ports of Los angeles and Long Beach, also in the mid-90’s timeframe. With regards to the CERB meeting read the Dean and Houston presentations as well as the discussion sessions including the comments from Mr. Headland. Most of the CERB discussions border on the mostly uninformed with respect to current state-of-the-art climate science. I actually got quite a few chuckles reading those discussions. Note that AFAIK, no modern day climate scientists (Dr. Seymour excepted) attended this CERB meeting (I’ll gladly stand corrected if others here spot other climate science subject matter experts (or SME’s)) who attended this CERB meeting. But wait, there is even more background on Drs. Houstion and Dean relating to the American Shore and Beach Preservation Association (Dr. Houston vs Dr. Orrin Pilkey) and the Florida Shore and Beach Preservation Association (Dr. Dean). Those materials date back to the 80’s/90’s timeframe (Dr. Dean has two recent articles published in the FSBPA). I will expand on this somewhat in a future post. The main question has always been, should we here in the USA build on the beach and should we protect or renourish said same beaches in the face of said building of the beachfront. Policy and politics rule the day here, at the local, state, and national levels (think Federal Flood Insurance Program in the coastal zone). I started working for the USACE in 1983 at the FRF in North Carolina, even then, I wondered if it were prudent to build on and/or restore the beach through renourishment and/or protective structures. If anyone here is from NC, I suggest you travel from Duck, NC to Currituck, NC, in my personal WABAC, circa 1983 (FRF) and circa 2006 (military symposium of Dr. Resio’s). What was once undeveloped beachfront, is now wall-to-wall million doller beachfront properties. My position then, as it remains to this day, is that we should NOT be building on the beach (mainly the Barrier Islands of the USA) and/or renourishing those said same beaches. My bias lies in that I’m not a Sand Engineer and that I abhor sand engineering, in general, but particularly on our very low profile (think elevations/coutour maps) Barrier Islands. Let’s just say that I like to engage in civil/structural engineering of a much less ephemeral nature. The counter argument, presented mostly by Dr. Houston, was for tourist trade and economical reasons, and it is that we should try to maintain those said same beaches, either at the local, state, and national levels. Fast forward to 2011 and we now know a whole lot more about climate change and potential future sea level change. All indications, from the Arctic and worldwide surface temperatures, melting and movements of the Greenland/Antarctica ice sheets perimeters, Arctic and worldwide sea surface temperatures, Arctic sea ice extents/areas/volumes, atmospheric CO2 concentrations and the oceans (limited and apparently reduced) capacity to uptake these increased CO2 concentrations in a warming climate, particulates (soot depositions in the Arctic and perhaps even spring releases of particulates from the Arctic flora)) (think about all those black/dark materials at the bottom of Greenland melt ponds (actually all over the place but mostly seen and accumulated where annual melting occurs), where the fact that fresh water has a maximum density at 39.4 degrees F (e. g. the densest waters of melt ponds will lie at the bottom of said same melt ponds (~4C above it’s freezing point), which have always existed, and which maintain pathways to the bedrock over the millenia, throughout the waxing and waning of our current ice age). I have a whole lot more to say on this paper, the JCR position on sea level change (as reflected in other published papers in JCR), a brief history on getting published in JCR (emails from Dr. Houstion (dating from the 80’s/90’s which I no longer have BTW)), and even some criticisms of the works Stefan and Martin and others on extrapolation of future sea level changes (but basically, one needs to be very careful of these extrapolations when the steepest part of the curve occurs at the end (present day) of said calibration/verification efforts, when the present day empirical data appear to suggest that we are not NOW at the steepest point of said sea level change). I will keep this current post relatively short by ending here. But expect future posts on said subject matter in the very near future. PS – Thanks Stefan for the Reply to JCR, I was thinking basically the same thing (a reply to JCR), but I’m not an expert on sea level change as you and many others are (the works of Church immediately come to mind, but there are many others). I will now read your JCR reply, but your abstract pretty much sums up the technical opinions that I had/have at the time of publication of the Houston and Dean paper). PSS – Well actually kind of a long opening post on my part. PSSS – I will gladly accept any counter arguments (here or elsewhere) directly from Drs. Houston and Dean, or any of their minions, or anyone else for that matter. Your numbers do not look right. I’m no ocean scientist, however my general understanding has been that ocean levels have been steadily rising by between 0-4 mm/year. Currently have been slowing down a bit to 2 mm/yr. I took a quick look at the NOAA and this appears to be much the case. Certainly not in the realms of what you present in your article. More Implications then previously thought.. It is also has zero credibility, is fundamentally anti-science and reflects a complete failure to understand how science is conducted. As it has been for centuries. Sea levels had the largest drop ever in 2010 and the rate has been going down recently. So why have sea levels been going down the last few years? > and the Florida Shore and Beach Preservation Association …. > renourishment and/or protective structures. That’s a good reminder — this is a crucial assumption for a large scale industry dedicated to propping up the value of real estate along the ocean by using state and federal dredging and construction. Don’t expect it to be a science question; investment has long since taken place and the time for ecologically rational decisions passed long ago. Yes, I spent most of my childhood summers on the Outer Banks and recall what they used to be like. They were beautiful. I’d think it reasonable to expect socks and mock-grassroots activity. Interesting chart in response to comment 20. Regardless of any acceleration in sea level rise over the 20th century, it sure HASN’T accelerated since 1994 according to the data – an overall fairly linear appearance. And since around 2006 (and even starting on the linear trend point), the appearance from the plot is that the rate of increase has slowed down. It’s apparent then that since 2006, the answer to the question is ‘No’. The next few years I think will be interesting given what I have seen about the lull in solar activity, from a sunspot and solar flux standpoint . . .
Well, that’s pretty much what I was trying to say, somewhat politely … but you’re totally right. This is agreed something between 0-4mm/yr and that’s not the question. Recently the rate has been going down and is currently around 2 mm/yr. And your data only starts in 1993. Look at the trend going back further. There’s little change from 0-4 mm/yr. NOAA are actual levels I could not find a reference to actual global numbers in your link. I’d be interested to look at if you can identify a specific link. So apparently we have some folks suggesting that totally normal and known-about (on century scales) La Niñas refutes climate science, physics, etc? Found the NOAA # – 2.9 mm/yr. That’s only since 1993 so very little to make any assessment I would have thought. As you can see from the chart, in the response to comment #20, that a similar decrease in rate of sea level rise happened in the early to mid 90s and again after 1998. And you can see how meaningless they look relative to the overall trend. And if you really look, you’ll see that cherry picking like this is ubiquitous at skeptic websites and with their claims. I urge people to read Houston and Dean rebuttal of Rhamstrof and Vermeer. It’s easy to read, precise, and very convincing. What do you mean by acceleration being “twice the quadratic coefficient” (in your caption to figure 1)? According to my understanding of calculus, acceleration is the second differential of position with respect to time, i.e. d^2x/dt^2. Fitting a curve to a quadratic equation, i.e. to an equation of the form y=Ax^2+Bx+C does *not* equate to a determination of acceleration, but is merely curve-fitting. An explanation would be appreciated. Thanks. I agree with the comment that it seems madness to continue to build along beaches and low lying land. As a structural engineer in Australia, there seems to be a huge blind spot with this one. I think it is partly driven by those who own the land thinking that they will be able to sell it when they want and convincing themselves that the impacts are a long way into the future. Some are simply taking the attitude that they will enjoy it while the sun shines! Unfortunately, people are going to get caught and won’t be insured whent he storm comes in and they lose everything. By the way, our brave Prime Minister is trying to establish a price on carbon – it looks lke it will pass the parliament. What happens if we get a change of government is still in question as the opposition leader is saying he will wind back the legislation. On La Nina, according to the NCEP Climate Forecast System the possibility of reemergence later this year is on the table. Thanks for the response Stefan. I agree that the second derivative of the equation x=At^2+Bt+C simply gives 2A. Using this in the context of sea level, however, assumes that the shape of the plot of sea level as a function of time follows a quadratic relationship. I see no physical basis for this. The actual data, as you have reported it, does not in any case follow such a relationship. Doesn’t it make more sense to derive a derivative from the data itself? Regarding your response to Comment 20, the graph you show does not show sea level rise accelerating, rather gently decelerating. And don’t forget that this data isn’t even the real sea level as it has had an isostatic adjustment (GIA)applied to it. If you want the actual sea level you have to subtract 0.3mm/yr … which leaves an even flatter curve. Average rise over the period (1994-2011) is only 2.8mm/yr and over the last 10 years or so is definitively less than 2. Why are you so insistent on the idea that sealevel rise is accelerating, when it obviously isn’t. IMHO, not really much of a rebuttal. The paper itself, in one word is, atrocious. They begin by using OLS on a quite arguably non-stationary process, very bad move on their part. See discussions on random walk, unit root, and more advanced statistical methods that should be applied in non-stationary time series analyses. However, note that statistics alone does not include the underlying physical processes themselves, there is no physical basis (e. g. physics based) for their quadratic curve fitting methodology. The statistics alone cannot explain causality, as in correlation does not equal causation, basic first principles type stuff. Their “model” is a simple double integration of time, and they even carry the 1/2 term as follows, y =A*t^2/2 + B*t + C, which is very old school, as this is just a 2nd order polynomial (please drop the 1/2 factor). There solution space is thus totally bounded by the constant curvature of their quadratic term, all explanatory power of their model is left in the constant “acceleration” term (A/2 in their nomenclature). Thus, this is but one, of many possible curve fitting approaches, that will have virtually no skill if extrapolated into the future, something that all real phyical based models should strive to achieve. Next up? Their capricious and arbitrary definition of record length, why 80 years? Why not 100 or 60 or even 40 years. Did they perform any kind of statistical metrics to arrive at this arbitrary number? In a word, no. Thus, the very valid claim of cherry picking arises as Stefan has noted above. Finally, looking at the global temperature curve, with it’s rather large bump in the 30’s/40’s, and with the full expectation that sea level rise would lag this temperature curve significantly, strongly suggests that the resulting sea level curve would be an offset upward bulge right in the middle of said sea level curve (in other words, a monotonic temperature curve would have producd a concave up sea level curve), and largely mask the actual underlying “acceleration” when curve fitting against time as the only independent variable. Note: I really hate using the term “acceleration”, as this has only one meaning in a strict physics based sense, a power law, or an exponential fit, does not exhibit a constant accelleration, any exponent greater than one is by definition non-linear and concave up. So yes, H&D are surely curve fitting, and not a single physics based equation is to be seen in the entirety of their paper. Go figure. Martin C, you don’t seem to have grasped the significance of the article at the top of the page. Firstly, the acceleration is small. It is very hard to see with the naked eye. Secondly, the data is noisy enough that it is absolutely impossible to come up with a meaningful eyeball estimate of the acceleration from a mere 15 year snippet of data. Look at the very first graph: you need over 40 years of data to get reasonable error bars. The satellite data is higher quality, and does allow calculations of acceleration with far less data, but still you can’t do it without actually running the numbers. Nearly all curves “look linear” if you focus on a small enough segment. This is how computer graphics work: curves are approximated with short lines. The comments about beachfront property are really interesting to me, as I used to be a reporter in Florida. I remember speaking to the guy whose job it was to do disaster planning for Charlotte County. (This is located south of Tampa and north of Fort Myers, on the Gulf Coast). I looked at a flood map in case of hurricane storm swells, and was, frankly, appalled. Half the county was underwater with a relatively weak (category 3-ish) storm. I asked him then, why in the name of all that lives do people build anywhere near the beach? Or at least, why build with the design (basically a house on a slab of concrete) that virtually guarantees the house will be utterly destroyed? It isn’t like hurricanes in Floria are a surprise, one shows up at least every other year or so. Now, I come at this as a native of New England. We get storms there too. And when people build near a beach, we don’t mess around. If you go to Scituate or Hull you will see houses on pilings. Big pilings. Pilings (and houses) that have stood for a century and are deep into the sand and soil. Where I am from you can see, under the WWII – era seawall, examples of the original works that were built. Many coastal homes are also built on the rock, anchored there. (Granted, the rocky-ness of the coast on the North Shore lends itself to this). But nobody in their right mind would ever, ever build a Florida-style house on Nahant or the Cape. And I think it says something that so many homes in my home area have stood for 100 or more years, facing some of the biggest storms that the North Atlantic and Hurricane Belt could throw at them. I got a very interesting answer from the disaster recovery official. He mentioned two factors: one is that people who move to Florida are often from areas that are not near the sea. “You respect it, you grew up with it” he said. “They don’t.” (This was, as an aside, also the reason he said the state led the US in accidental boating deaths). The other issue is property values. Everyone wanted a beachfront house. But to build them up to snuff would take a lot more money than the developers were willing to spend. New England is proof that you can build one heck of a sturdy house near a beach. But that is going to cost you. Your profit margin, as a developer, from flipping the house is going to be much reduced. And in Florida, if there is one lobby that is powerful, it is real estate. Now, the developers who flip the houses have no incentive to build anything that will stand longer than a few months, as they are out of the game once the home is sold. I might add that Charlotte County recently experienced a hurricane (2004) and 5 people were killed in the county. The science is pretty clear: sea levels are rising. Coastal Florida counties have a choice. They can do what the Dutch did and do, but the costs will be high and it will mean vast changes in the way Americans live in Florida. Or you can stop building in sight of the sea. (And don’t allow people to re-build there). The cost there is much less and fewer people die, though the real estate lobby loses out. “Definitively,” eh? There’s some noise in that data set…can you show us how you calculated the error bars? And came up with the conclusion that the mean is “definitively” less than 2? In one of your recent threads you discussed a paper on salt marsh sediments that showed a global 2.1mm per year rise in sea level for the last century. Your acceleration figures appear to be about 50x smaller than this. Can we conclude that variations in sea level in the technological age are dominated by non CO2 related phenomena? Or would it be equally reasonable to suggest that quoting sea level rise acceleration accurate to 1/100th of a millimeter, given that the Church White data is based on tide gauges. Is short term sea level rise prediction factoring in relative fluctuation in actual Atmospheric Pressure, I was talking to Proffesor Le Querre some time ago, and their’s a few more questions to be raised ? I took the satellite data from the University of Colorado sea level site and spit it into two equal halves. I charted the data and ran trend lines through it. The rate in sea level rise for the first half was 3.4 mm/year. The rate of rise of the second half was 2.1 mm/year. For the satellite era at least, the rate of sea level rise is falling. The rate that is shown by the second half of the satellite record would give us 8.3 inches of sea level rise in 100 years. I’ll have to keep this brief so as not to go to far off topic. Here in the USA we have FEMA which with the help of the USGS, USACE, NWS, and private concerns defines the 100-year flood plains everywhere (inland and coastal). We also have the Federal Flood Insurence Program, which is the only way to get flood insurence if you live ABOVE the 100-year floodplain. Above is a very important word when one builds in the coastal zone (but above still applies in all situations). So what’s a person to do? Well most states have building coded that require you to build your beachfront property above the 100-year FEMA floodplain. To do so, requires you to build your home on stilts and most (if not all) state codes also require that the void space between the ground elevation and the actual 1st story be kept clear of any obstructions. So what happens if your multi-million doller beachfront home is destroyed during a hurricane and you also have flood insurance? You and I get to pay for it’s replacement (seriously, through our tax dollers). When has the POTUS not declaired a disaster when a whole bunch of people get flooded out? AFAIK never. Finally, older existing ground level homes are grandfathered, in that they can’t get flood insurance, but these structures are still habitable and, of course, sellable. Yes, it is very conceivable. However, basing risk on assumed acceleration of sea level rise when there is actually deceleration would seem to be even less predictive than linear extrapolation. And while there may have been acceleration going from the pre-satellite era into the satellite era, that acceleration has now ceased and changed to deceleration. As a geologist, I take a longer-term perspective. The current rise in sea level began some time between the mid-19th to late 19th century–after the end of the “Little Ice Age”, when the Earth started to warm up again and mountain glaciers worldwide began to recede, but the average global SL trend over most of the 20th century has been ~1.7-1.8 mm/yr based on various compilations. Since the advent of satellite altimeters in 1993, the trend has been ~3 mm/yr (combined satellite and tide gauge data). Does this represent an acceleration? Possibly. The longer this trend persists, the more likely so. By the way, the latest paper by Church and White (2011; Surv. Geophys. publ. online Mar. 30, 2011) reports a linear SLR of 1.7 mm/yr 1900-2009; 1.9 mm/yr 1961-2009; satellites 3.2 mm/yr 1993-2009; tide gauges 2.8 mm/yr 1993-2009. They conclude that there has been a statistically significant acceleration since 1880-1900 of 0.009 +/- 0.0035 mm/yr2. What makes recent sea level rise noteworthy is not so much the interdecadal fluctuations–like the apparent deceleration of the 1930s, noted by several authors, likely associated with a Northern Hemisphere temperature decrease around that period (cause?? ), but rather the overall increase in the 20th century trend (by 1-2 mm/yr in many cases) relative to that of the preceding millennia (can cite reference upon request). While this seeming “bombshell” seems newsworthy, mainly because the climate skeptics are jumping on it, should it merit more attention, than say some of the other recent climate controversies, like the flap about the leaked e-mails and questions over Michael Mann’s “hockey stick” curve, because of a few dubious tree ring records, or a poorly documented claim about how soon Himalayan glaciers will disappear? The way things are going now, it would seem that sea level rise will have to accelerate quite a bit, if it is going to catch up with drought as a serious problem.